Whatever the weather is, this one of a kind smokeless grill gives you that great backyard barbecue flavor while it promotes healthy, low-fat cooking. 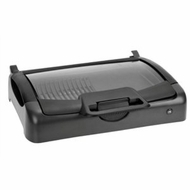 Premium non-stick surface with grill and griddle cooking zones sears perfect steaks, chops, burgers, veggies, or easily make pancakes and eggs in the morning, any fats drain away into the internal drip tray which could be filled with water for smokeless grilling. Large cooking surface feeds the whole family indoors or outdoors It features tempered glass lid for easy viewing or to be used as a wind shield. Take it anywhere you go, the grill shots close - briefcase style - to store away and has a strong carry on handle when on the move. Adjustable temperature control gives you perfect cooking with maximum control.